The Mystic Star Womens 3/2mm is your first choice for tackling the British Summer time in the water! 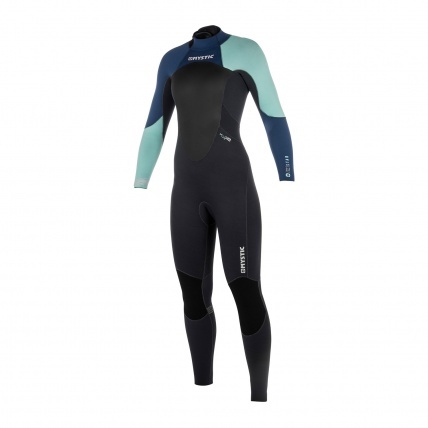 Stay comfortable this season with Mystics super soft touch and flexible M-Flex neoprene providing a quality finish and fit for a wetsuit at this price. The Mystic Star 3/2mm also features a mesh panel on the chest to divert wind away from your core while riding and on the beach to help keep you nice and warm. Beneath this mesh panel we have a chest and back polar lining to radiate heat and maintain your core temperature and keep you more focused on your riding than the chill of English waters! The Womens Star has been pimped out with a few features such as GBS (Glued Blind Stitched) stitching where the stitching does not fully perforate the neoprene and is glued to finish resulting in a water tight seam throughout the wetsuit. This keeps the warm water trapped inside the suit while preventing any cold water from breaching in. With critical taping to reinforce key areas of the stitching and act as an extra barrier the Mystic Star also features easy entry back zip and and overhead back up to prevent water from running down your back!